Real Estate Listings Gig Harbor: Let Us Help You Find a Waterfront Property in Gig Harbor! Gig Harbor is known for its amazing culture and abundance of entertainment options, but it’s perhaps most famous for its exquisite waterfront properties. In today’s post, we’ll explain why your next luxury home should be a waterfront property in Gig Harbor. If you’re ready to begin your search, then get in touch with Team Aro’s Realtors® to get started! Seattle is a massive city, and some people find the hustle and bustle of the big city to be overwhelming. Gig Harbor is about 50 minutes away from Seattle, and while it’s certainly much smaller than Seattle, there are plenty of fantastic dining and entertainment options in the area. At the time of this post, for example, we’re looking forward to the 11th Annual Gig Harbor Film Festival, which takes place from September 13 to September 16 this year at The Galaxy. With more than 80 filmmakers from across the globe, after parties, and an awards brunch on Sunday, September 16, you’re bound to make this event an annual tradition! Throughout the year, you’ll find that Gig Harbor has numerous nightlife and fine dining opportunities, including some of the best seafood in the state. Whether you’re looking to celebrate a special occasion or make lasting memories with your loved ones, you’ll love the number of great options throughout Gig Harbor. 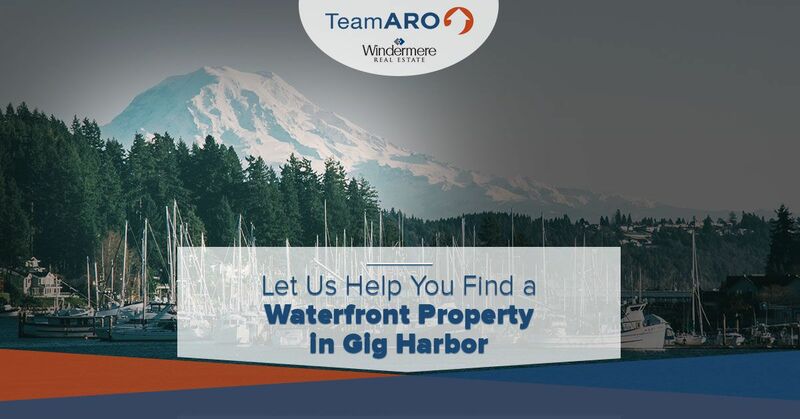 Team Aro is proud to be Gig Harbor’s premier real estate team. Visit our site, www.teamaro.com/home, to learn more about how we can help you find luxury real estate! The Gig Harbor real estate market is fast-paced and constantly changing, and our Realtors® have the experience and the knowledge to help you find the perfect property. To speak more generally, many buyers look for waterfront properties in Gig Harbor because of the close proximity to Seattle’s beautiful natural areas. Gig Harbor is just a short drive away from Bresemann Forest Park, one of the most luscious areas in Washington. Mossy trails, tall trees, and breathtaking views can all be expected when you make your way to this park. If you’re looking for a way to get out on the water, then just head to the coast and rent a small boat for the day! Are you more of a homebody? When you own a coastal home in Gig Harbor, you might actually find yourself staying in more to appreciate the amazing views. You can wake up and take a stroll on the beach during the warmer months of the year, and you can sit inside and enjoy your coffee on cooler mornings. There’s also truly something spectacular about looking over the water as the sun slowly fades into the horizon, and you might just find it difficult to leave your house once you’ve purchased a luxury home in Gig Harbor. These are just a few of the reasons why you should consider purchasing a waterfront property in Gig Harbor. Keep an eye on our blog page for future posts in which we’ll continue to provide you with information about the culture and entertainment opportunities in the area. If you’re ready to take the first steps toward the coastal home you’ve always dreamed of, then please get in touch with one of our Gig Harbor Realtors® to get started! We’ll work within your budget and your timeframe to find a home that perfectly fits your needs.